When it comes to backcountry skiing and snowboarding, the perfect backpack will either make or break your expedition. Whether you’re hucking yourself off big cliffs, squeezing through narrow chutes or weaving down through powdery trees, you need a backpack that you can trust. Before we present the top 5 Best Ski and Snowboard Backpacks of 2017, make sure you know what kind of skier or rider you are. If you’re a wilderness addict, hoping to adventure out into the mountains for days at a time, look for a bigger backpack built to store enough food and clothes for any time spent away. If you’re a mountaineering specialist, make sure you purchase a bag with rope, crampon and ice axe storage areas. Not all come equipped with these features. Lastly, if you’re looking to dive into some gnarly, untouched powder fields then make sure you look for packs with ABS compatibility. These packs might boast a higher price range, but will save your life in the end. Knowing who you are and where you ride should influence what backpacks you get. These five backpacks below are all proven exceptional and offer something different for every backcountry aficionado. While the newest Dakine backpack has a lengthy name, the product deserves its every breath. 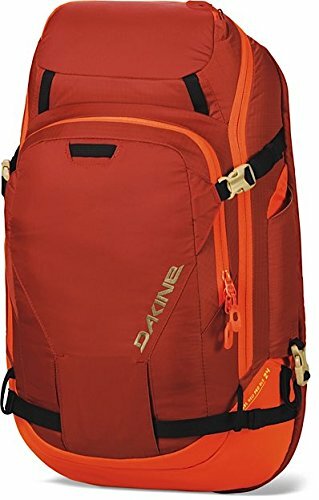 Marked down from $120 to $60 (check this listing for the latest live prices)in some places, the Dakine ABS Heli Pack combines every backcountry feature you need into one sleek, lightweight and futuristic backpack. Expert skiers and boarders admire the new Dakine backpack for its revolutionary ABS Avalanche Vario Base unit and airbag compatibility. With ease, backcountry lovers can zip a separate Vario Base Unit onto the Dakine baseplate. The airbag then sits tightly between the skier and the pack allowing for maximum floatation in times of distress. With a sturdy diagonal ski and vertical snowboard carry option, the Dakine ABS pack is best for skiers looking for serious backcountry daytrips. As a plus, the backpack’s structure supports maximum hold in rough terrain making long snowmobiling expeditions hassle free. Like most backpacks nowadays, the Dakine ABS pack is constructed primarily with Nylon Ripstop to prevent wear and increase durability. The pack itself includes Dakine’s characteristic fleece lined goggle pocket as well as their front helmet attach loops and filtration system area. The pack also features a vertical side pocket that zips shut, granting skiers and boarders easy access to their beacon, water bottle, gloves etc. 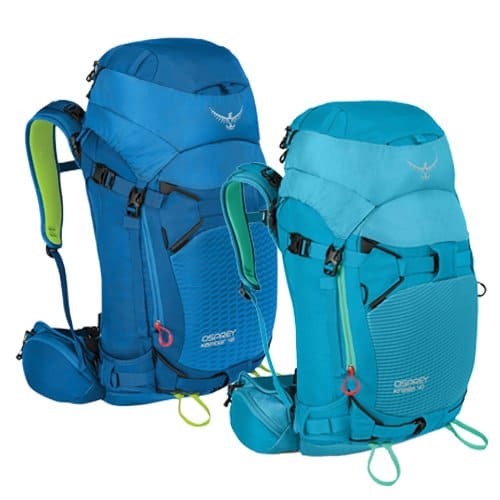 In 2016, Osprey launched their newest Kamber and Kresta backpack series — nearly identical backcountry packs built for men and women respectively. Originally priced at $190 but now found for $150, the new series provides every necessity skiers and boarders need to satisfy their wildest mountaineering dreams. With enough storage space for an overnight trip or a long-haul expedition, the Osprey Kamber and Kresta outperform much of their competition with ease. The backpacks come complete with an under-the-lid rope carry system, reinforced wear points to prevent unnecessary damage from ski and board edges, dual ice-axe loops that tuck away for storage and a large J-zip front pocket with secure areas for both your shovel and probe. The backpacks’ top portions also detach for lighter, day trips. Osprey also outfitted their backpacks with several uncharacteristic, but useful storage areas and zippers. For starters, a padded hip-belt with pockets allows riders to easily access essentials such as their phone, food or other smaller items without stopping to take their pack off. Just above the hydration area, you’ll also find a mesh pocket, which stores everything from keys to handwarmers. To help ease transitional moments, the engineers at Osprey installed direct access to the pack’s inner contents through the thermoformed back panel. From a storable helmet area to a state-of-the-art suspension system, the Kamber and Kresta packs include all the basic backcountry needs and more. With Diagonal and A frame ski carry options as well as a vertical board carry option, the 42 Liter Kamber and Kresta packs boast unrivaled versatility, storage and comfortability. 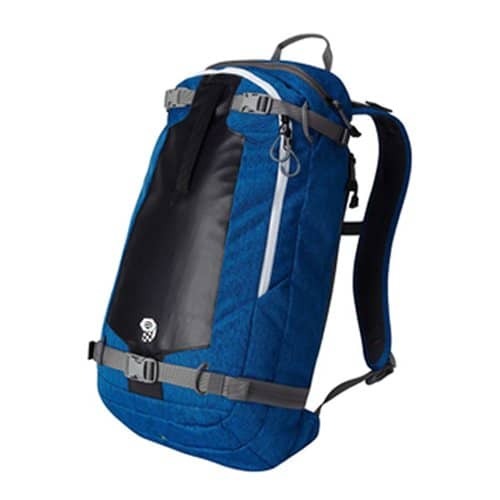 The series also comes in a 32 L and 22 L size. Best For: Overnight backcountry trips and mountaineering expeditions. Weighing in at only 4 lbs. 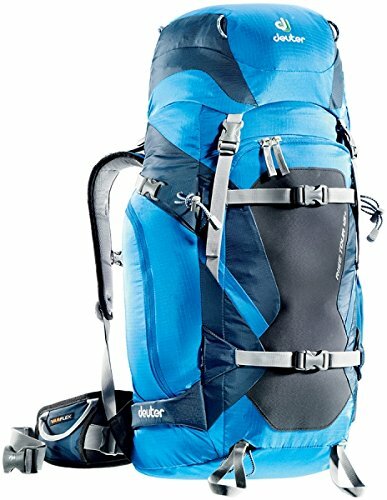 and 1 oz., the XL Deuter Rise Tour 45+ Liter backpack comes highly recommended for any multi-day ski trip. Although it touts a higher price point at around $195, the compact backpack is well worth the investment. The XL Rise Tour pack is best known for its extra-stable back support system, side pouches and front pocket material. The Deuter Alpine Back System utilizes eight features to ensure stability, comfort and suspension. Most notably, a removable X-Frame with curved profile aluminum stays transfers weight comfortably across your back. This feature, paired with a unique U-Frame, VariFlex hip fins and channeled back pads ensures that even in the hairiest of situations, a jam-packed Rise Tour will not throw off your balance. The extra-long side pouch allows direct access into the heart of the bag, whereas the front pouch provides a safe, aerated storage space for wet and used clothes. Durable Hyperlon material protects the front pouch from crampon spikes and board edges while Deuter’s Microrip-Nylon fabric, a lightweight material, stretches across the rest of the bag for maximum protection. Several other unique features distinguish Deuter from its competition: A whistle attached to the shoulder strap signals an emergency to fellow skiers, a detachable waist strap alleviates weight, a repackable foam mat deploys for overnight use and a SOS informational label promotes safety. Overall, the Deuter Rise Tour 45+ Liter ranks amongst the top backpacks in the world for any overnight expedition. The pack comes in blue and black or red and black. Best For: Overnight and multi-day ski trips. The North Face Snomad comes in both a 36 Liter and 26 Liter size and gears itself towards the more extreme day skiers. With versions coming in red and blue and a price point well below much of its competition, skiers and boarders will fall in love with the sharp, sleek and athletic design that is the North Face Snomad. Built with the same specifications as rival backpacks, the Snomad sets itself apart from others with several unique and patented features. Most notably, the Snomad’s shoulder straps combine just above the chest to form a unique glove carrier, useful for long hikes in hot weather or when your hands just need some fresh air. The backpack also utilizes a revolutionary, integrated helmet carrier. Unlike most ski pack models that simply strap the helmet onto the outside of the backpack, the Snowmad wraps an extra flap around the helmet to prevent snow entry. This not only better protects your helmet, but the design ensures that no storage space is lost in the process. Impressively enough, although the Snomad lacks the storage area that many bigger backpacks sport, it still utilizes the same features in its design. The back panel unzips for easy access into the primary compartment, the waist strap contains a small pocket for essentials and the pack has modular ABS routing tunnels. Make sure to double check whether or not your beacon and probe can fit into the Snomad. Some say that certain probes may be too large to fit into the designated storage areas. If a lightweight, compact pact is what you seek, then look no further. With 20 liters of capacity, 1lb. and 14 oz. of weight and a price point around $50, the Mountain Hardware Snojo feels virtually weightless on your back. While smaller than most packs, the Snojo manages to include both a dry storage compartment for food and electronics as well as a wet storage areas for beacons, crampons and probes. Like the Snowmad and other packs, the baseplate zips on and off, allowing for quick access into the main compartment. Perhaps the backpack’s most notable feature is a full-wrap compression system with glove friendly buckles. This system enables both diagonal and A-Frame ski carry as well as vertical snowboard carry option. Just make sure to pack your heavier items at the bottom of the pack to strengthen the A-Frame hold. The Snojo is a small backpack and should only be used for short- to medium-length day hikes. If used properly, the Snojo will far exceed expectations. Unlike most backpacks that often attach too many straps, the Snojo has no loose ends. If you want, you can even stow away the waste strap after your hike.